Brazilians are shocked. Only three years after the country’s biggest dam disaster, in Mariana, a new mining dam collapse killed at least 99 people on Jan. 25 in Brumadinho. Both towns are in the state of Minas Gerais, in southeastern Brazil. The collapse at the Córrego de Feijão dam complex, which holds back mining waste, unleashed a river of mud upon an area populated by both mine workers and tourists. According to the local Fire Department, the rupture involved three dams. The cause of the disaster is still under investigation. The state’s civil defense agency says that 259 people remain missing. The last survivors were found on Jan. 26. The chances of finding others are remote; victims were likely buried in the mud. That mud mostly consists of mine tailings—waste left behind after companies dig up mineral ore and run it through mechanical and chemical processes to remove the most valuable materials. “We do not have earthquakes or tornadoes, but we have Vale,” Brazilians say. That non-honorable mention goes to Vale S.A., a multinational corporation working in mining and infrastructure. Vale was privatized in 1997, but the federal government is still a minority shareholder. As of 2016, it had more than 76,000 employees. Vale is the owner of the Brumadinho mine and is also a 50 percent shareholder of Samarco, the company responsible for the Mariana tragedy of 2015 in the Rio Doce Valley. In that disaster, the Bento Rodrigues Dam burst and killed 17 people while wiping an entire village off the map. At least 600 locals were left homeless. That dam collapse also pushed 60 million cubic meters of iron ore waste and toxic mud through woods and rivers and into the Atlantic Ocean. Last week’s collapse in Brumadinho affected a smaller area but created a much larger human tragedy. It buried the mining company’s cafeteria, offices, working fields and tourist hostels that were in use at the moment the dam collapsed. The disaster also destroyed homes belonging to indigenous people and small farmers who depend on the Paraopeba River to survive. The tragedy raises anew the question: Is Brazil capable of pursuing economic development while responsibly caring for its environment? “Vale is deeply concerned about the victims. It will rescue and care for people and do everything in its power to try to cope with this unimaginable situation,” said the company’s C.E.O., Fabio Schvartsman, in an interview to GloboNews TV. On Jan. 30, Mr. Schvartsman told journalists that the company will close 10 other dams that use the “upstream” method adopted in Mariana and Brumadinho, in which mining waste and tailings are used as banks for a containment dam. That method is cheaper than more modern techniques, but it is generally considered less safe. Brazil’s environmental minister, Ricardo Salles, called the upstream dam system “archaic” and said that new regulations for mining are needed, as well as more regular inspections. The Rev. 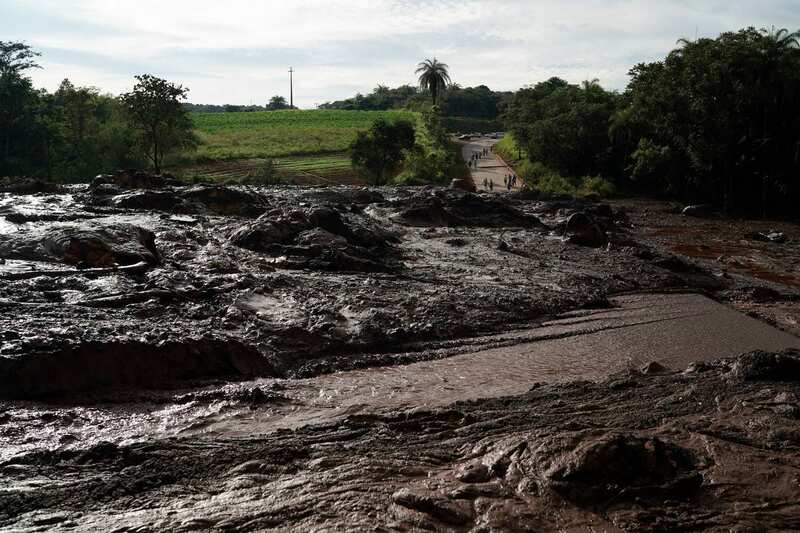 Antonio Fernandes, a member of the Movement of People Affected by Dams and a vicar at the São José-Paula Candido parish, told Catholic News Service that the religious who work with populations near dams and mining exploration areas worry about both the human and environmental costs of this tragedy. “Once again, [in Brumadinho] profit is put above human lives and the environment,” Father Fernandes said. He regrets that damages will affect the area for dozens of years. According to the Archdiocese of Belo Horizonte, because of the higher death toll at Brumadinho, getting humanitarian aid into the region should be a priority. Local bishops and priests have visited the area offering spiritual and moral support. Pastoral agents are taking donations, clothes, food and water to those who have been displaced. “It is necessary to rethink development models that disregard respect for nature and sustainability parameters,” the archbishop said, in a written statement about the disaster. Brazil turns far-right. What role did religion play in Bolsonaro’s election? The new president of Brazil, Jair Bolsonaro, reacted quickly to the disaster; he flew over the area the day after it happened. He also set up a team of ministers to manage the crisis. “We will do everything within our power to support victims, minimize damages, clarify the facts, promote justice and prevent new tragedies like Mariana and Brumadinho, for the sake of Brazilians and the environment,” the president said on Twitter. A government environmental agency immediately imposed a fine of $66 million in U.S. dollars on Vale because of the Brumadinho disaster. According to the New York Times, Brazilian police have arrested five people, including three Vale employees, who were responsible for verifying the safety of the dams. The moves represented a clear change in tone regarding environmental policy by the Bolsonaro administration. Both Mr. Bolsonaro and Mr. Salles had defended streamlining the process of granting environmental permits. As a candidate, Mr. Bolsonaro pledged flexibility in environmental policies to encourage businesses in rural areas. Before taking office, Mr. Bolsonaro also planned to merge the ministries for the environment and for agriculture, but he has changed his mind after negative reaction to that idea. Still, his pick for environment minister, Mr. Salles, is close to agribusiness and was convicted of “administrative impropriety” while he was the head of a state environmental agency in São Paulo. Since his trip to the World Economic Forum in Davos, Mr. Bolsonaro tried to generate positive headlines for his approach to the environment. “Our mission now is to advance in the compatibility between the preservation of the environment and biodiversity with the necessary economic development, remembering that they are interdependent and inseparable,” the president announced on Jan. 22 in Davos. According to Carlos Rittl, executive secretary of the Observatório do Clima, Mr. Bolsonaro has also pledged to work with the rest of the world to reduce CO2 emissions. The Catholic Church in Brazil has been an advocate for ecological justice. The Catholic Church in Brazil has been an advocate for ecological justice. Father Geraldo Martins Dias, the pastoral coordinator of the Archdiocese of Mariana, told America that the church pursued two main objectives after the dam collapse in 2015. The first was to offer spiritual assistance and sustain a sense of community. “Whole communities were destroyed, about three or four hundred houses disappeared,” Father Dias recalled. After victims moved to temporary homes, the church provided spaces for them to gather with their original parish priest and friends. Several Caritas offices are among the church institutions offering legal and practical support in the aftermath of the disaster. Three years after the Mariana collapse, the goal is to have families relocated and neighborhoods rebuilt wherever possible. The Renova Foundation, created by Samarco, is in charge of dealing with victims’ demands to the mining company. Father Dias believes the creation of such institution caused a slowdown in terms of reparation and reconstruction, saying Renova should act as a mediator but instead tends to favor the interests of Samarco. That is a mistake, he believes, that should be avoided in Brumadinho. “This should be about repairing damages that the company itself has caused,” Father Dias said. The Brazilian bishops’ conference commented on this latest dam collapse, quoting Pope Francis’ encyclical “Laudato Si’” and reaffirming what they had said in 2015 about the dam collapse in Mariana. “It is necessary to put a limit to profit at all costs, which often neglects security measures and protection of the life of people and the planet,” wrote the president of the bishops’ conference, Cardinal Sergio da Rocha. Brazil’s bishops also urged authorities to ensure stricter inspections to mining fields, enact more “ethically responsible” laws and display more agility in delivering justice to disaster victims. Who comes up with titles for articles in this publication? The article does nothing more than raise and discuss issues that naturally arise whenever there is a disaster. I may be missing something, but I do not see any discussion in the article of a possible inability of Brazil to both pursue economic development and protect the environment. The answer to the question posed in the irrelevant title is “Yes”. Parenthetically, while tragic, this flood pales in comparison to others we can recall, e.g. the Johnstown flood of 1889, which killed over 2000 people. Excellent comment; thought the same thing after I read the article. This is a Jesuit publication, so Brazil being the largest nominally Catholic country in the world, I give credit to Filipe for his occasional coverage of Brazil, but it does seem he could use some help from the editors in framing the issues. Filipe, meu amigo, nao leva a mal.... tamo juntos e senti firmeza. Deus e brasileiro. Filipe Domingues contributes from Brazil.